To purchase tickets visit ticketmaster.com or call 877.250.2929. 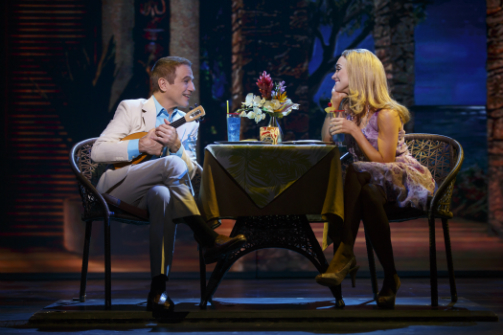 Tony Danza and Brynn O'Malley in Honeymoon in Vegas. Photo by Joan Marcus. BOTTOM LINE: Perhaps I am rationalizing the stereotypes due to my delight in hearing Tony Danza's crooning swagger, but I like to think that this really is a fun show. Jack Singer (Rob McClure) is a man in love. He feels so lucky to have Betsy (Brynn O'Malley) in his life, but after five years he still won't propose. Jack is haunted by his mother, whose dying wish was for him to never get married. Trying to muster up the courage to walk down the aisle, Jack and Betsy fly to Vegas on a whim. Meanwhile gambler Tommy Korman, a slick scam artist, is working with lackey Johnny Sandwich to cheat unsuspecting suckers. Jack turns out to be the (un)lucky fool of the trip as Tommy tries to win over Betsy, since she is the spitting image of his late wife, Donna. Lies and ridiculousness perpetuate strange circumstances as Jack tries desperately to get Betsy back. Besides being sweet on Mr. Danza, I have another bias when it comes to Honeymoon in Vegas: the writers. The amazingly talented Jason Robert Brown is responsible for the music and lyrics, while the book is written by Andrew Bergman. I am quite partial to the vigor, passion, and silliness with which Brown creates and performs. Also, I am one of many who is eagerly awaiting the movie release of his off Broadway musical hit The Last Five Years. Mr. Bergman is probably most known for co-writing Blazing Saddles; the groans and eye-rolls I emit as a result of his work are often accompanied by an amused smirk. My brother and sister-in-law actually did have their honeymoon in Vegas and from the perspective of someone who has never been there, their photographs sure made me yearn for the glitzy nightlife. The Las Vegas in this show did not inspire that same excitement for me. I mean, can you really do a kick line with only two showgirls? I found many things in short supply, including a too-short tap dance from Mr. Danza. Honeymoon in Vegas portrays women as idiots, with the Betsy simply wanting an engagement ring the whole time. When you see the entirety of the plot, it is obvious that the ring is just a symbol. Betsy is just frustrated and confused as a result of her emotions being toyed with as Jack attributes his ambivalence to his mother's curse. But where do we draw the line between art and meanness? Again with the stereotypes, there is a Hawaiian woman in the show who tries to make “friki-friki” with Jack. The broken English and manner in which she tries to seduce him seems insulting to those who are from, or even just familiar with, Hawaii. Looking at the piece as a whole though, it seems like this show is not singling out types of people to attack, but rather making fun of everyone. Honeymoon in Vegas is an enjoyable ride, even if you have to take it with a grain of salt.